It was a very happy holiday season for this Virginia's Eastern Shore horse. I just can hardly believe that Wiley, my beautiful Arabian horse, first arrived on Virginia’s Eastern Shore one year ago last month, my most unique Christmas gift ever from my son ! As they say, how time flies ! Wiley really, really loves it here on the Shore, romping around with all his new friends, soaking up the cool breezes off the water, enjoying the Eastern Shore’s temperate climate, munching the delicious pasture grasses, visiting friends on other farms because the Eastern Shore really is an equestrian paradise. At Wiley’s cosy anniversary party, the guest of honor calmly munched carrots and sugar cubes in his stall while my son and I toasted his good health with some pretty nice champagne. But truth be told, Wiley’s first Christmas in his new home, a brand-new and spacious barn on a large waterfront farm just south of Cape Charles, Virginia, was just about more than the poor little fellow could handle. Just trying to figure out which stall buddies to give apples and which stall buddies would prefer carrots was pretty taxing, plus having to decide whether it was truly necessary to put a bow on them all. 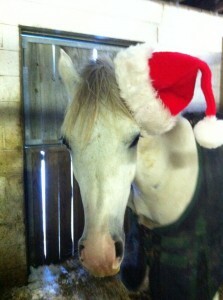 And then having to decorate his stall because he didn’t want to seem like the barn Grinch ! Not to mention that the older horses were all party, party, party into the wee hours, keeping Wiley and the other colts up half the night. It was enough to give a young horse dark circles under the eyes. Although he loved all his Christmas gifts, including a new halter and a beautiful new green plaid blanket, soft and warm as a down comforter, ( nicely gift-wrapped for him by Dover Saddlery www.doversaddlery.com ), Wiley still insists that it’s lucky that Christmas comes only once a year ! He thinks the craziest thing is that the barn is already looking forward to the Christmas holidays next year. But I let him know not to worry, come next December, he and I will face it together. P.S. If you love horses and are thinking of a move to the Eastern Shore of Virginia, please call me at 757-678-5200 and I will e-mail you some data sheets on our great “horse-friendly” properties. 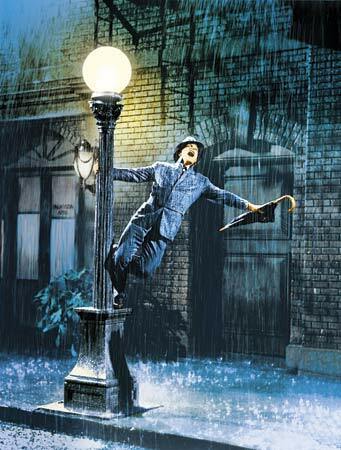 Well, maybe not exactly singing in the rain, because I have a terrible singing voice, but definitely smiling about the rain ! In a December post describing the Christmas 2010 snowfall we had here on the Eastern Shore of Virginia, I mentioned that our temperate coastal climate is definitely one of our area’s great attributes, one of the many delightful aspects of our coastal livestyle. Usually when areas nearby are wrestling around with snow, here we are having rain. 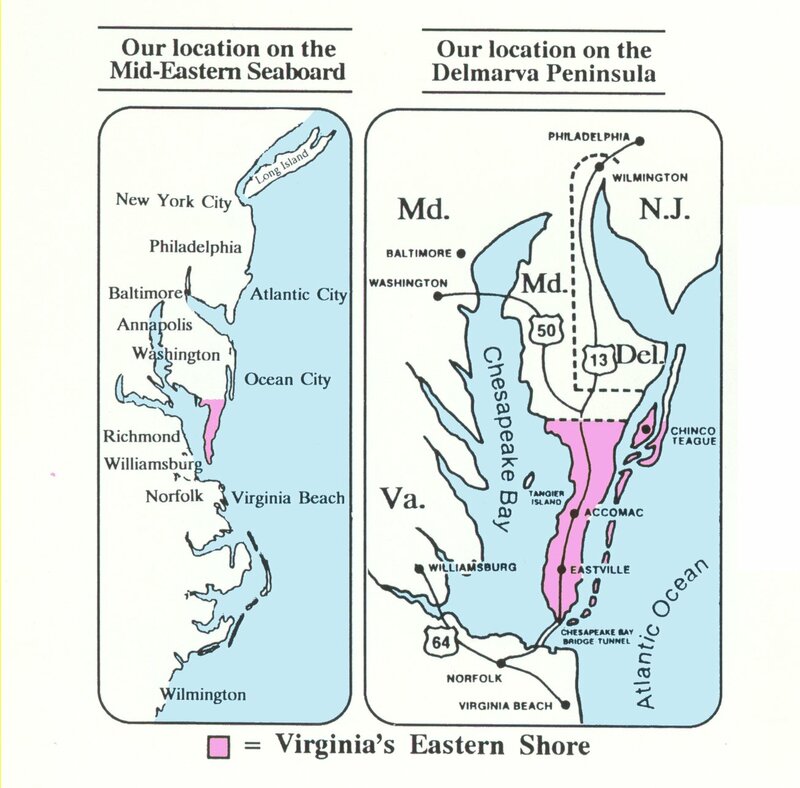 Being a slender peninsula bordered to the east by the Atlantic Ocean and to the west by the Chesapeake Bay, the proximity of these large bodies of water helps moderate our temperatures in both summer and winter, so that we remain warmer in the winter than nearby areas and cooler in summer ( plus we get delightful summer breezes blowing gently off the Chesapeake Bay. ) So even though it rained yesterday for most of the day, pouring buckets from time to time, light showers in-between, I was glad to see it. Not for us the snarled traffic, snow, slush and 400,000 + homes without power this morning in the Washington DC metro area, with some folks reportedly being trapped last night in a 13 hour commute as described at www.washingtonpost.com . Not for us the 15 inches of snow that fell in New York City and parts of New Jersey and Connecticut, that closed schools, airports, offices, etc. as reported at www.nytimes.com . For us not even the comparatively puny 11 inches of snowfall in Boston which created massive morning commute problems today. Nope, for us yesterday it was high temps in the 40’s and rain ! Sweet, sweet rain, refilling farm ponds, recharging aquifers, giving my car a needed wash, irrigating the long line of dwarf azaleas we planted last fall along our driveway, pattering on the roof, a quiet sound and especially welcome in lieu of the snow, snow, snow piling up in other areas. 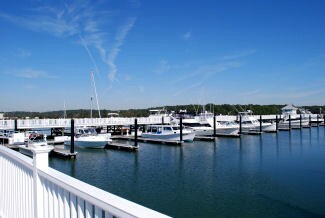 ( If you’re sick of freezing cold, snowstorms and ice storms but like a moderate four season climate, check out our great coastal listings on www.blueheronva.com . ) So, yes, yes, yes, once again our traditional moderate climate has proved true, no snow for Virginia’s Eastern Shore. I’m smiling about the rain, just smiling about the rain. Trying to find a historic home that was built well and that has maintained all the charm that only time and history can provide is not always an easy task. But that was just exactly what Paul and Kim Chandler were looking for when they asked me to assist them in locating and purchasing a historic beach house in the charming waterfront town of Cape Charles, Virginia. 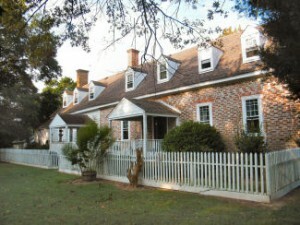 After several trips and eagle-eying a number of great possibilities, the Chandler’s ultimately selected 204 Bay Avenue, one of the true “Grand Dames” of Cape Charles. Built around 1920, this is a home that had been in the same families for many years– in fact, the Chandlers are only the third owners of this beautiful property. 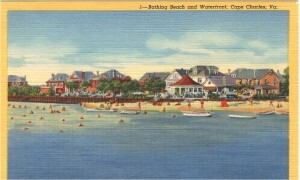 Chances are if you have been to Cape Charles you have driven or walked down Bay Avenue. This beautiful street is embraced on the west by the Chesapeake Bay and on the east by a line of the spectacular historic homes, the Grand Dames of Cape Charles, occupying the choice building spots in the town. 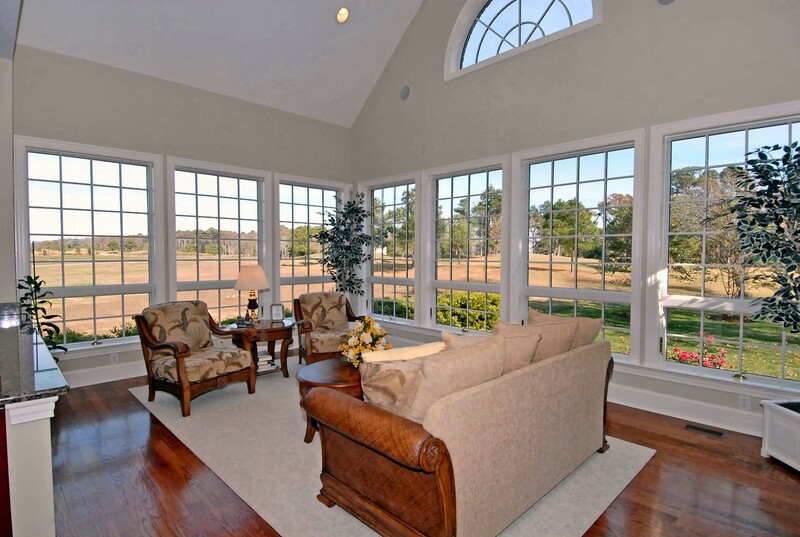 A house on Bay Avenue is the perfect spot for spectacular Chesapeake Bay sunsets and 30 second access to the Cape Charles glistening sand beach. And one of these impressive ladies is just about to undergo a much needed face lift. As with many of the homes in Cape Charles, over the years additions have been made– for example, on 204 Bay Avenue, the portico that is currently attached to the left of the house was not original to the home. Otherwise, not much else has changed on Bay Avenue since then, same serene Chesapeake Bay views, same gorgeous sand beach, same relaxed, small coastal town feel. The Chandler’s were kind enough to agree to allow me to blog about the process as they move forward this spring with the actual renovations. 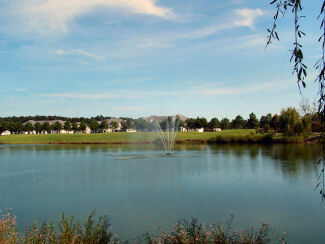 To date, most of the work already done has involved landscaping. The grounds, which were quite overgrown at the time of purchase, have been tidied, trees and shrubs have been pruned , giving a whole different feel to the property. Vines were removed which has allowed sunlight to pour into the house, making a big difference to the feel inside. Just knowing that the first steps have been taken to start this multi- phased project has brought smiles to the faces of neighboring property owners ! This Grand Dame is beginning to look quite grand once more. As work inside starts moving forward this spring, I will be posting some interesting renovation tips and some “before and after” photos as we proceed with the 204 Bay Avenue Renovation Journal blog. 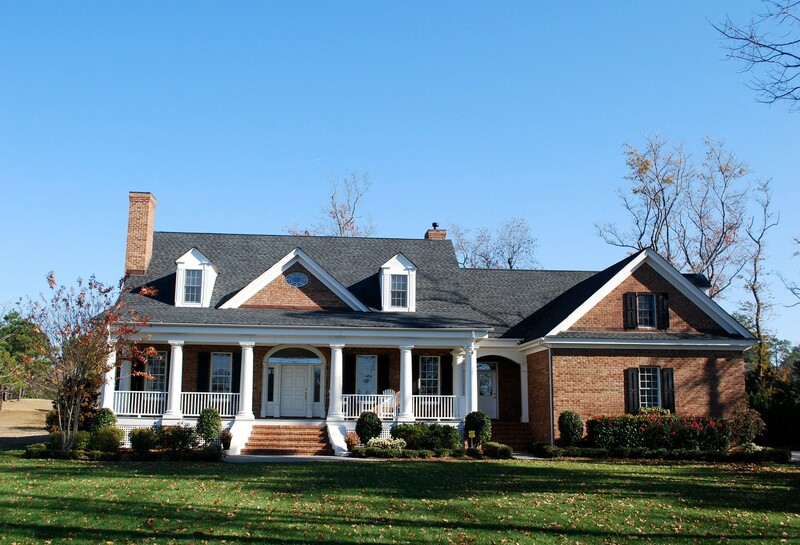 And if you are thinking of trying to locate a historic home all your own to renovate, please call Blue Heron at 757-331-4885 and I will be happy to forward data sheets on some of the very interesting opportunities available at this time. 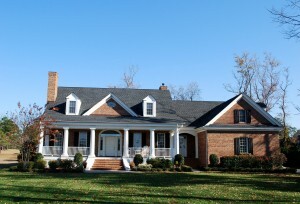 Or check out some of our listings of Victorian homes and historic homes on our website, www.blueheronva.com . 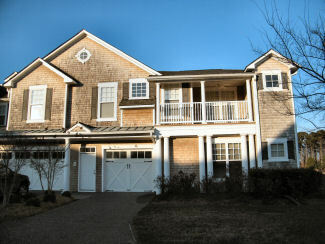 Where In The World Is The Eastern Shore Of Virginia ??? One of the most frequent questions we get from people from out of the area who are responding to our ads is “Where exactly is the Eastern Shore of Virginia ? 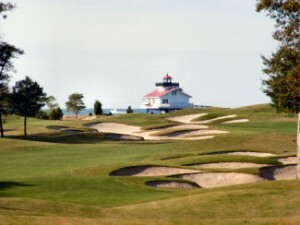 ” Mother Nature has created this remarkable little slice of the earth as a slender peninsula, bordered on the east by the Atlantic Ocean , on the west by the Chesapeake Bay, to the north bordered by southern Maryland with access to mainland Virginia via the engineering marvels of the Chesapeake Bay Bridge Tunnel complex ( www.cbbt.com ) . Being at the corner of the Chesapeake Bay and the Atlantic Ocean is a truly primo address, clearly. But when we moved here nearly twenty five years ago, almost nobody I knew had ever heard of the Eastern Shore of Virginia, period– except people who lived here, obviously. About twenty years ago Blue Heron Realty Co. sponsored a “meet and greet” booth at the annual Homarama builder show in an effort to raise greater awareness in the Virginia Beach/Norfolk area of the real estate possibilities here on the Eastern Shore of Virginia. 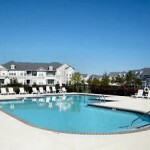 It was funny, in a sad sort of way— people would stop for a brochure and comment that they had never heard of the Eastern Shore, although we are less than an hour away from almost anyplace in Virginia Beach or Norfolk. That experience and a few others like it led us to write a little book in 1989 (out of print now), replete with lots of photographs, about life and real estate on Virginia’s Eastern Shore. Back then the Shore was an extremely rural area and definitely not for everyone, no shopping centers, almost no restaurants, no world class golf, just exquisite waterfront property. Having the book enabled us to lend out copies to people who were thinking of coming to look real estate so they could get a feel for the area, in advance of making a trip, see if it matched up with their needs, contemplate whether or not this was an area for them. 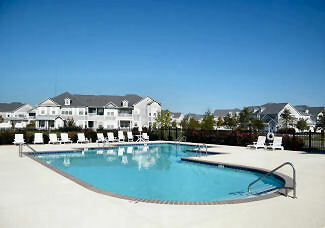 And now, 22 years later, the Shore has changed a lot, we have amenities galore. But even in 2011, many people still have never heard of the Eastern Shore of Virginia although they probably recognize the names of some of our little towns, Cape Charles, Onancock or Chincoteague ( the Shore’s great tourist area and home to the famous annual pony swim and auction www.virginia.org/site/features.asp?featureid=711). 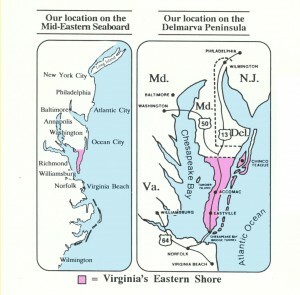 It’s easy to see where we are on the Eastern Seaboard from this little map graphic– about 3 & 1/2 hours from Philadelphia, about 4 & 1/2 from most of New Jersey, about 6 hours from New York City, about 4 hours from the Washington DC/Baltimore area, 1 & 1/2 hours from Williamsburg, 3 1/2 hours from Charlottesville and from Cape Charles, less than a 1/2 hour from Virginia Beach and Norfolk. 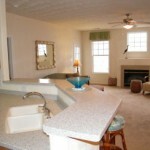 Our area is really so close to a great many major metro areas– easy for friends and relatives to visit or to visit them. Better still, not only is it easy to get here but when you live here it’s so easy to access wonderful events and attractions in other areas ! 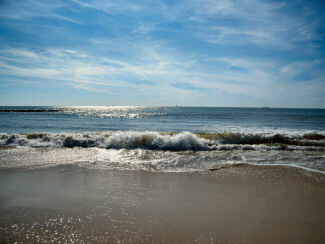 The Eastern Shore of Virginia is “easy trip” paradise. Hankering for the mountains ? Zip to Charlottesville. Nordstrum’s having a big, big sale ? Zip to McArthur Center in Norfolk. 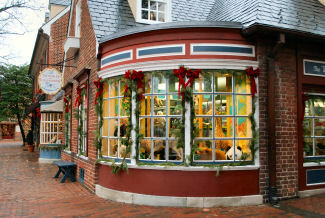 Want to visit Capitol Hill, the Library of Congress, the amazing National Zoo or go to the annual National Book Festival ? Zip to Washington D.C. . Annapolis Boat Show calling ? Zip, zip. Longing to see Wicked on Broadway ? Zip, zip, zip, pass go, have dinner in Chinatown, then on to the Great White Way. Like State Fairs ? Zip to Richmond, just 2 & 1/2 hours away. You get the picture…. Virginia’s Eastern Shore has a fabulous central location, with easy access to and from some really great places. 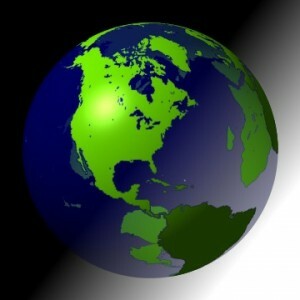 So that’s “Where In The World” the Eastern Shore is located — right in the middle of many of the good things of life ! I had been doing a little research for a customer who is interested in an amazing historic home Blue Heron Realty Co. has listed, the main portion of which is believed to have been built in Colonial times, possibly as early as the mid- 1700’s. 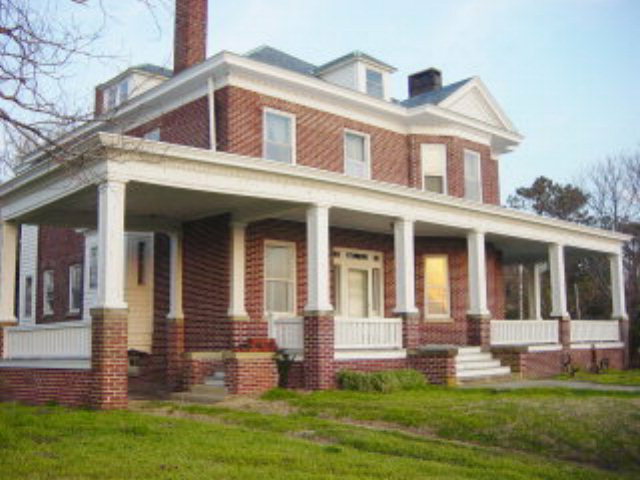 Named Wellington House, it’s a beautiful historic brick home, very well preserved, Flemish bond construction, located on a wide saltwater inlet from the Chesapeake Bay near Nassawadox, Virginia. 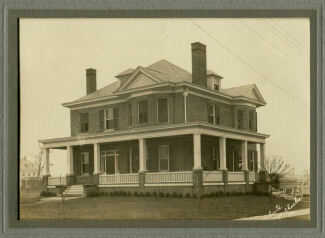 ( For more info, click on the Historic Homes listings on www.blueheronva.com ) The goal of the research was to glean additional detail about its origins and history, possibly even locate a very old photo, ( although a photo is always a lot to hope for) . As part of the research process, a trip to the “Eastern Shore Room” at the Accomac (main) branch of the Eastern Shore of Virginia Public Library system seemed in order. For anyone doing detailed research on the many historic homes and buildings located on Virginia’s Eastern Shore as well as general research and genealogical research, the “Eastern Shore Room” is a treasure trove indeed. A great many very old photos have been donated to the library, including a collection of fine shots of historic buildings taken in the late 1800’s by Griffin Calahan, most of which have been digitized so that the tap-tap of a mouse will yield a copy to take home with you, no charge. The library is also the recipient of the papers from six of the main persons who have done genealogical abstracts here and it contains all the Eastern Shore abstracts that have been complied as well. Its collection of issues of local newspapers stretches all the way back to 1881. 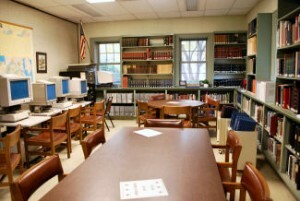 The “Eastern Shore Room'” as a separate space to house their burgeoning collections was established in 1976 and is the acknowledged best source, possibly other than the Library of Virginia or the Library of Congress, to research topics related to the Eastern Shore of Virginia. A number of singular items can be found here including rare photos, a very rare 1st edition of Sterling’s “History of Hog Island'” and an original map of Cape Charles dating back to the time the town was founded, 1886. Dr. Miles Barnes, Editor, "The Seashore Chronicles"
The curator of all these valuable and unique papers is Dr. Miles Barnes. 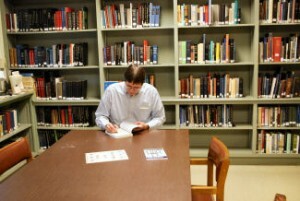 I asked Dr. Barnes how long he had been with the library and was surprised to hear “36 years” , as he looks so young. ( I’m guessing his parents never had to wonder what he was going to be when he grew up, having started at the library part time as a mere boy ! ) In partnership with the University of Virginia, Dr. Barnes has published a fascinating project on railroads and how they transformed the Eastern Shore. He is also an editor of a book about the Virginia off-shore Barrier Islands entitled “The Seashore Chronicles”, which I highly recommend as most interesting reading. ( In fact, it was so interesting I bought a copy as a gift for Eldest Daughter, who also loves historical books, and asked him to sign it for her. ) The library’s collection of Eastern Shore items has grown so substantially they can no longer be housed in the one room. Like the Lone Ranger, a local bank, Shore Bank , has come to the rescue of the library, ( whose current building is now over 45 years old ), with the donation of five acres of land adjacent to Shore Bank’s headquarters in Onley, a prime location. Funds to construct the planned new 30,000 sq. 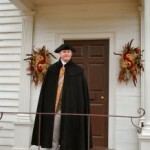 ft. building will be raised from private donations, grants and from foundations. ( Funds can be donated now to the Eastern Shore Public Library Foundation www.friendsespl.org/ . ) 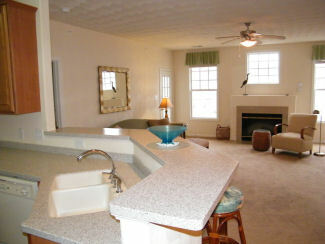 Obviously this is an exciting time for Dr. Barnes and the “Eastern Shore Room” . Because of current space constraints, parts of the collections are scattered now in five different locations within the library but can be all pulled together in the new facility. Then, having talked his ear off and also having been lucky enough to locate a photo of Wellington House taken in the late 1800’s in the archives of the Calahan Collection, ( which Dr. Barnes kindly not only printed but copied the file to a CD for me ), it was goodbye, you’re awesome, see you again soon, to the “Eastern Shore Room”. 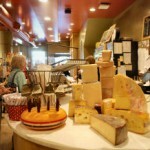 What do apples, lemons, pomagranates and boxwood sprigs have in common ? 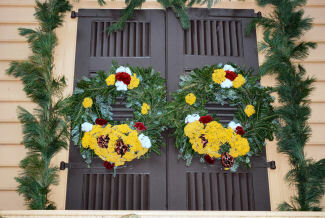 They are all part of the grand Colonial Williamsburg tradition of decorating the doors in the Historic Area with wreaths, sprays and swags that glow with the colors of citrus fruits and apples, brilliant reds, yellows and orange set against the dark waxy green of boxwood or pine sprigs. 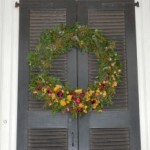 And not just fruit laden wreaths appear– in the many years that we have visited Williamsburg, Virginia during the Christmas season we have seen a tremendous variety of herbs, dried plants, cinnamon sticks, seed pods of all kinds, magnolia leaves, etc. 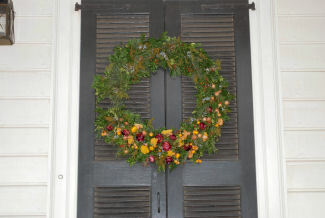 all used to create the delightful door decorations which grace the Historic Area homes each year. 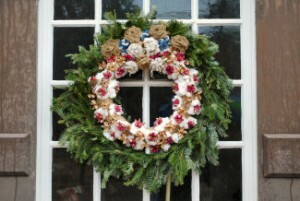 One of the most memorable was a very large wreath decorated with just about every type of shell that is common to our coastal area– oyster shells with mother-of-pearl interiors showing, pink scallop shells, swirled whelk shells, ribbed clam shells, dark bearded mollusks, long razor clams, tiny periwinkles combined with boxwood, holly berry sprigs and long pine cones to create a really interesting decoration, one that really commemorated our magnificant Atlantic Ocean-Chesapeake Bay region. 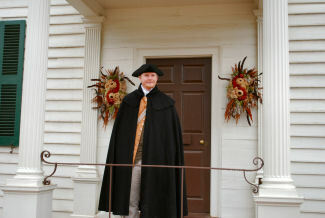 Just about every year we make a day trip to Williamsburg over the holidays. 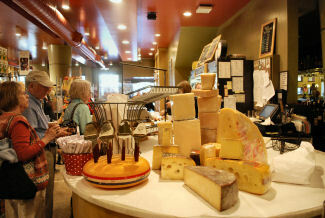 It’s a relatively short drive from Virginia’s Eastern Shore, about an hour and a half or so depending on traffic, and is such a holiday treat. ( Actually, one of the nice things about living on the Eastern Shore of Virginia is how many fun events are so near by and easily accessed.) 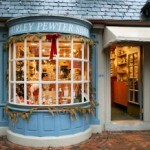 Normally we make a day out of it, leaving the Eastern Shore in time to have lunch at The Cheese Shop or The Trellis before walking down Duke of Gloucester Street to see all the creative displays. Everything on every single wreath is natural, no plastic red apples, no golden styrofoam pears, no water-proof ribbons, no silk ivy — it’s back to the basics, real items, things that were actually grown on land, sea or air ( lots of feathers sometimes). 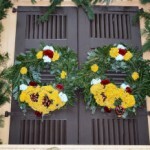 This year was no exception, the decorations looked terrific. 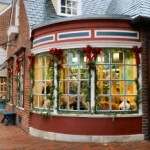 A bit pressed for time, we ducked into The Cheese Shop for a quick bowl of potato and leek soup (definitely a favorite Colonial recipe) and one of their delicious Smithfield ham sandwiches before setting out to view this year’s crop of decked out doors. Pineapples, the traditional symbol of hospitality in Virginia, were in plentiful supply on both wreaths and swags. 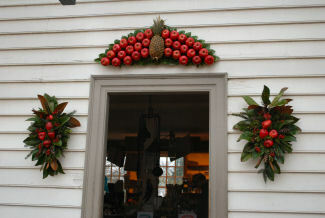 Several wreaths featured the tiny but very sweet Virginia apple called the Lady Apple, pale yellow with a rosy blush. 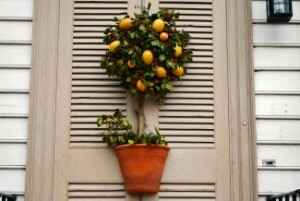 A very clever wreath decorated with large lemons featured a clay pot below, looking for all the world like a miniture lemon tree affixed to the door. 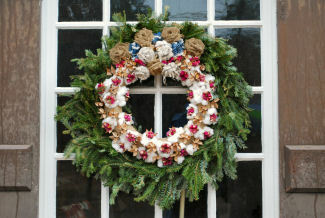 But our very favorite decoration this year was a simple but elegant wreath of fraser fir with an overlay of a wreath made from puffs of raw cotton, dried cotton bolls and stalks, burlap swags plus pink pods of some type, all fashioned together most ingeniously. Tracking back towards Merchants Square we did a quick look-see into the holiday windows in some of their unique shops– the Toy Shop and the Pewter Shop looked especially grand this year. 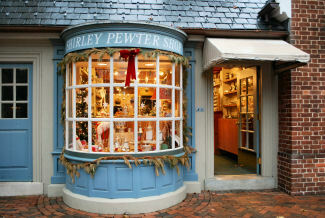 And then zip-zip, back home to the Eastern Shore after having enjoyed immensely yet another holiday trip to Williamsburg. The snow actually started just as we were sitting down to dinner on Christmas Day. It had already been a long but exciting day, starting with the arrival of Group One consisting of two “big kids”, two little kids and two brand new puppies for brunch ( everybody had a wonderful time, the puppies were adorable ), moved on to phone calls to those far away, a visit from those having dinner elsewhere, then on to Group Two for dinner. Actually, at our house, Christmas dinner is always a simple affair, unlike Thanksgiving where my eldest daughter thinks dinner isn’t complete without at least six or seven different side dishes, including the always mandatory homemade mac and cheese and collard greens ( I’m not originally from the South but have taken well to the Southern notion that collards, cooked with a little bit of country ham for seasoning, are a “must” on Thanksgiving ). Offerings of pecan pie, pumpkin pie and possibly coconut cake tempt one from the dessert table. The Christmas menu in contrast is quite simple and always the same– roast beef, twice-baked potatoes, a green veggie, a big green salad, cheesecake and pecan pie for dessert. Potatoes and pies made ahead, salad greens washed, spun dry and popped into Tupperware ahead, mushrooms for the peas or green beans all sauteed, everything tucked into the refrigerator, the cheesecake courtesy of The Cheesecake Factory, my world- famous, well, family-famous, port wine gravy started a day ahead so flavors can marry overnight— absolutely no cooking to do on The Day, just pop the roast into the oven and finish the gravy. But back to the snow, which started just as we were getting settled into dinner. I flipped on the outside lights so everyone could enjoy the sight of big, fat flakes slowly drifting down— they were indeed big fat flakes but they were not slowly drifting, they were pretty much twirling and swirling at a pretty rapid rate, giving me my first clue that Slater’s forecast might be right on the mark. It was a beautiful sight though, large white flakes set against the night sky. Snow is a rarity on the southern tip of the Virginia Eastern Shore– usually if it snows nearby, it just rains here because of the moderating influence of having the Chesapeake Bay as our western border and the Atlantic Ocean as our eastern border– it just doesn’t get cold enough. But not Christmas night– it was cold, it was snowing, it was sticking ! I think it is hard for people from areas where lots of snow is simply routine to fathom how on earth a few inches of snow can snarl up an entire region. But if you seldom have snow then you seldom have snow tires, snow chains are unheard of and you have no practice driving over snow and ice. And your municipality has very little snow removal equipment. So trust me when I say that 4 inches of snow here closes schools, offices and the county– it’s an official Snow Day, break out the hot chocolate and marshmallows ! So if you’re still braving winters in New York, Connecticut, Pennsylvania and other icy places but are considering real estate on the Eastern Shore of Virginia, relax, take heart, usually it warms up right away, within a day things are generally back to normal. But not this time– according to official reports, this was our biggest snow in nearly a quarter of a century and it was the 7th largest snow on record in Norfolk ! As everyone was saying their goodnights on Christmas it was snowing hard and by the time we woke up on the 26th it was just about a white-out. 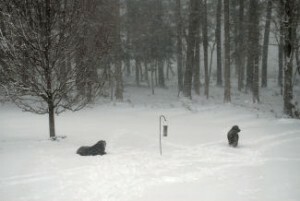 The Newfies were so excited, they dashed out, practically did summersaults in the snow, raced around wildly, then plopped down in a little drift, just chilling out ! 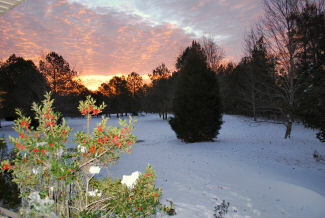 Dawn on the 27th brought bright pink skies over a thick blanket of dry white flakes. 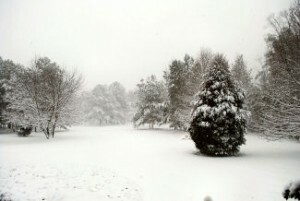 By the end of that storm Cape Charles, Virginia had officially had about 7-8 inches of the cold white stuff and it was pretty clear that it wasn’t going to disappear overnight. However, I was prepared to relax and just enjoy it– office closed, new Christmas book at my elbow ( autobiography of Mark Twain) —- let it snow, let it snow. let it snow ! ( Of course the forecast of 50 + degrees for Thursday was very comforting ! ) And when I saw the snow totals from New York City (23 inches) and parts of New Jersey (26 inches) and Cape Cod– well, let’s just say that I felt pretty doggone lucky to be here on the Eastern Shore of Virginia, where our mere 7-8 inches was one for the record books. But I will be a bit more careful next time about wishing for snow— because we might actually get some ! 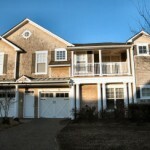 You are currently browsing the Life and Real Estate on the Eastern Shore of Virginia blog archives for January, 2011.